Review: Softlips Organic Lip Conditioner and Giveaway! Thanks to Mom Select, for sending me the Softlips to review. Softlips is a 95% organic lip conditioner. It is 100% natural. It contains a blend of organic oils, beeswax and shea butter. It also has Vitamin E to protect the lips. This product is free of pesticides, harsh chemicals, and parabens. It is gluten-free and cruelty-free which means is does not test its products on animals. It comes in a variety of flavors, but I tried the Pure Peppermint kind. I liked the long skinny tube because it fit easily in my pocket. I liked the minty smell as it kind of gave me a little wake up when I put it on. The product went on very smoothly and stayed on. My lips have felt soft all week. Once it was on, I liked to keep applying it throughout the day. I would like to try their raspberry flavored lip conditioner or their tinted varieties. 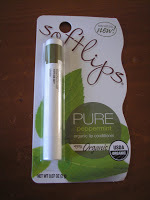 Lucky for you, I have a Softlips Pure Pepperment to giveaway to one of you. All you have to do is go to http://www.softlips.com/ and then come back here and leave me a comment telling me which product you would like to try if you could. Be sure to leave me an email address to contact you. The contest is open until 11:59pm Monday, Sept 14. I will choose the winner using random.org on Tuesday, Sept. 15. I would try the honeydew. Well you know how I am about organic stuff- certainly the pomegranate one for me! Pretty simple. I'm a cherry girl! The pomegranate sounds the yummiest to try! I would love to try the winter mint and vanilla flavor! Thanks so much for your generosity!